NEW YORK, New York, September 16, 2013 (ENS) – A United Nations team investigating the possible use of chemical weapons in Syria has found “clear and convincing evidence” that Sarin gas, a chemical weapon, was used in an incident on August 21 in the Ghouta area on the outskirts of Damascus. The investigating team arrived in Syria on August 18 and on August 21 the group was in Damascus preparing to conduct on-site inspections concerning the use of chemical weapons in Khan al-Asal and in Sheik Maqsood and Saraqueb. 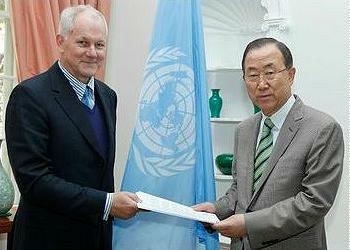 The secretary-general instructed the team to focus its investigation on the Ghouta allegations. Now that the team has filed its report on the Ghouta incident, it will continue its investigations into the use of chemical weapons on these other locations. During its investigation of the Ghouta incident, the team visited Moadamiya on August 16, and Ein Tarma and Zamlka on August 28-29. Team members conducted interviews with survivors and other witnesses. Statements from more than 50 exposed survivors, including patients, health workers and first responders were collected. The team also documented munitions and their sub-components, collected environmental samples and also collected hair urine and blood samples. The samples were analyzed in laboratories designated by the Organization for the Prohibition of Chemical Weapons, in four European cities. The secretary-general will shortly brief the press on the findings in the report following his meeting with the Security Council. He also will present the report to the UN General Assembly. The secretary-general welcomed the agreement reached on September 14 between Russia and the United States on a framework for the elimination of chemical weapons in the Syria.